By now you’ve probably seen it or read about it: Chad Billingsley this morning pitched five full innings of two-hit ball, yielding only two free passes to go with three strikeouts. He threw most two- and four-seam fastballs which started 89-90 but were more 90-92 as the game got going, and touched 93 once. He threw a couple of change-ups which came in at 84-85, although I can’t recall that it was an effective pitch for strikes. The big hook came in 74-76, which was effective as a strike-out pitch at times, but not featured. We didn’t get to see the 64-MPH “ephus-like” curve that we’ve heard about. The IronPigs won the game 8-4. Maikel Franco had two hits, including a triple. 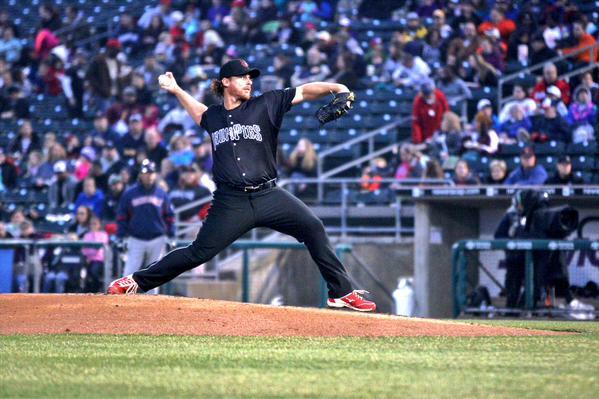 Billingsley’s following start would be with the IronPigs at home on Saturday, April 25, versus Buffalo. If he does indeed need a third start, it would be Thursday morning 4/30 versus Durham on another “education day” 10:35AM first pitch. It’s worth noting, that the trip to Reading isn’t that much different than the trip to Moosic, where the IronPigs will be on Monday, but I suppose it’s to keep him in front of the home fans and for the brass from Philly to observe if they so choose–it IS closer to Philly. For Reading fans, note that Friday has strong rain possibilities–I know, I hate it too for opening day–so a Nola/Biddle doubleheader on Saturday could be in the works (again). Good to see Mikael Franco (.296 avg, 1 HR, 7 RBI) getting his act together quickly. In terms of coaching philosophy, I was always taught that, if you have good players, you can go ahead and challenge them to be better. Simply because good players will respond favorably more often than not, or so says that particular school of thought. I think the IronPigs fan base should challenge our young friend from the Dominican Republic for his very own good. Let us openly dare Mikael Franco to be a dominant ball player for the IronPigs in the International League. Not next month when the weather warms up, not next year when the guy is a little more experienced and a little more mature, not next whenever & whatever. Right here and right now — Mikael Franco can thank us later for our invaluable role in his player development after he becomes a quality player at the Major League level. Yeah, I probably should have referenced that phrase from his first start. Good catch. I was mostly interested in the three more starts–usually these dudes declare themselves ready WAY before they are–I remember Zambrano pitching twice in Clearwater and he was supposedly “ready” (according to him). Also, the Reading part was interesting. As far as Maikel? I’m not sure what to make. He’s been absolutely full of life: pumping up his teammates, having fun, totally into the game. He had a couple nice defensive plays the other day, too. But, then he got benched (we assume) for not running out a drive to the wall. The triple today? He came out of the box kinda slow watching to see if it would get caught by the sliding left-fielder. A full sprint from the start and maybe–maybe–it could have been an inside the parker. Good to see him turn on a curve ball yesterday, though. And, he’s young. A work in progress, just gotta keep his head on straight and at the same time not press too much. I’m not ready to draw any conclusions or make any generalized statement other than that, though, which is why there hasn’t been a post on the subject. At this point, I’m happy to have him on the team and he’s fun to watch every night. Yup, it’s a fact — You can lead as many horses as you like to water … but it is true that you can’t really MAKE the horses drink the water unless that is what they, themselves, actually want to do. Well, it’s time for me to go to work. I know if I don’t strike for excellence at work at all time, I’ll get fired fast. If Mikael Franco has less strict terms of employment, then more power to him.